You can preview Baldwin's book at Amazon.com. For fastest order processing and checkout you can purchase the book for $13.95 plus shipping through PayPal or Google Checkout! Finally, a book with practical advice you can really use. 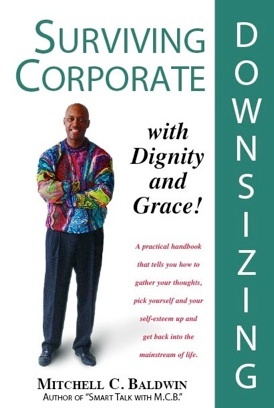 Surviving Corporate Downsizing With Dignity and Grace! opens your eyes to the issue of downsizing in corporate America. The news media and the government claim we are enjoying a robust economy. Yet, thousands of people continue to be downsized. Mitchell Baldwin offers outstanding advice to people who have been recently downsized, and to those who are still waiting for the axe to fall. Presented from a Christian standpoint, Baldwin offers financial advice that is practical and easy to understand. Besides that, it works! Other chapters deal with suggestions for what to do next, such as retraining or getting additional education, job hunting, and even starting your own business. Baldwin also address the depression and anxiety that you may experience after leaving your job, as well as the guilt often felt by the survivors. Get a copy today for your own personal library, or for someone you know whose job may be at risk or who may already be out on their own. You will not find another book dealing with so many different topics involving downsizing and its shattering effects. Nor will you find another book offering so many positive solutions and presented in such a practical, easy to follow format.